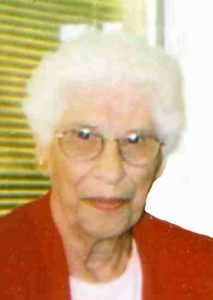 Darlene Harmon, age 104, of Comfrey, died on January 10, at St. John Lutheran Home in Springfield. Visitation will be on Tuesday, January 15, from 9:30 am to 10:30 am at the New Hope Lutheran Church in Comfrey. Service will be held at the New Hope Lutheran Church in Comfrey on Tuesday at 10:30 am. The clergy will be Jerome Klotz and Chaplain Noel Wetter. Interment will be at the Congregational Cemetery, rural Comfrey. Arrangements are with the Sturm Funeral Home in Comfrey. On line condolences may be left for the family at www.sturmfh.com. Darlene Harmon was born August 28, 1914, in Gladbrook, IA, the daughter of Henry and Anna (Berry) Smith. She graduated high school in Jewell, IA. She was united in marriage to Frank Harmon on June 19, 1933 in Jewell, IA. The couple lived in Jewell, IA, Frost, MN, Blue Earth, MN and Comfrey, MN. Darlene worked for Gauger Hardware, Barreson Clothing in Comfrey, the Comfrey Hospital, and Eat Shoppe Café. She was a member of the United Church of Christ in Comfrey. Darlene enjoyed participating in Women’s Fellowship, reading, cards, and puzzles. She is survived by her daughters – Gloria (Dale) Elsing of Comfrey and Frankey Sneer of St. James; 6 grandchildren; 6 great grandchildren, and 7 great great grandchildren. She is preceded in death by her parents; husband – Frank; son – Roger (Marlys) Harmon; grandson – Kurt Harmon; and brothers – Frank, Boyd, Herchel, and Wayne.